I believe there's only a couple of Tiguans on the forum? Any niggles faced till date? How is the performance of the gearbox especially in stop-go traffic? Also, does anyone have updated pictures of the new infotainment system? I was told by the sales team that VW is making space to produce and sell the Passat now, and Tiguan will only be back in stock in January 2018. Theres one Grey Tiguan in stock each at the two dealerships in Ahmedabad. I really like this car, but the Passat tugs at me with the richer interiors plus DCC to boast. Would ask current owners to start an ownership thread please. Why is it considered as a way to hide failure? They might have set a not so ambitious target for 2017 and would have cleared that. Not a bad statergy; considering the pricing of the Tiguan, the margins will be quite fat. Absolutely no niggles so far. Tiguan is a very well built car except for couple of things like stiff suspension and not so perfect seats. I understand the suspension is designed for European countries and they will not do anything different for India when it is a CKD. But the seats could have come with better upholstery and cushioning. About the city drive, the auto hold and active drive assist with rear/front sensors make it an easy task. DQ500 is so damn good for both city traffic conditions and highways. Unless you want do a drag race, there is nothing you can complain about the engine performance and transmission. Done 2000+km so far and my average fuel economy stands at 12kmpl. Crawling city traffic gives me around 9-10kmpl and spirited highway drives return around 15kmpl. 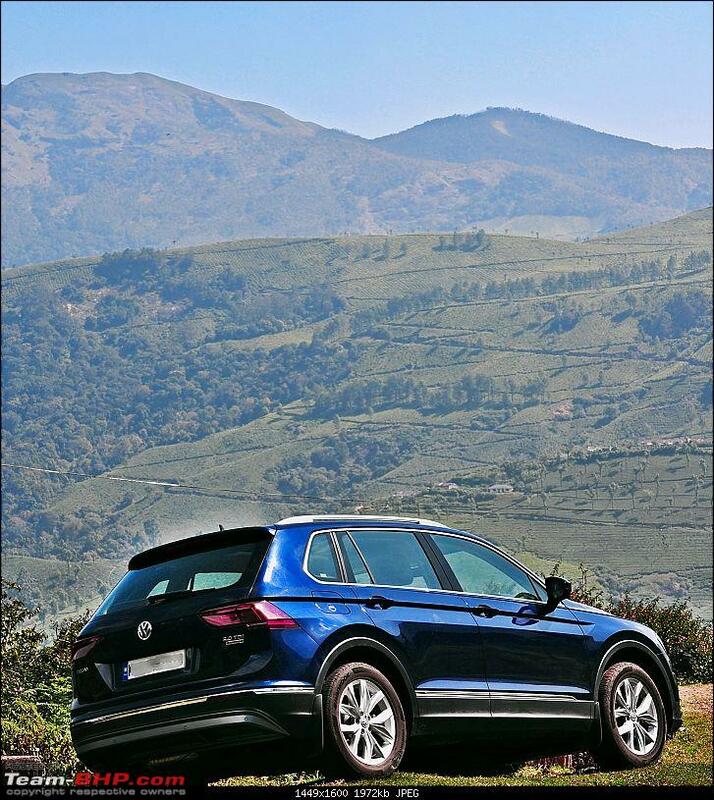 I would put my money on Tiguan if I was in market today. Compass and Tucson AWD launched after I bought Tiguan hasn't changed my opinion. Only contender would be Endeavour. Thanks for the positive inputs. So how does the driving mode 'individual' change the characteristics of the car? Does it allow to set the suspension as well? I'm reading different stories about the ground clearance everywhere. Some say 149mm where as some reviewers have quoted 200mm. Is it possible 149mm is the fully laden GC? One of my biggest concern is the headlights because I so often drive during night time. I hear low beams are good but high beams are scattered and not so decent. Also Tiguan misses the projector LED set up with swiveling lights which the US version gets. May be VW plan to update the same. Also misses LED fog lights. It is definitely laden GC. See the snip from team bhp official review. 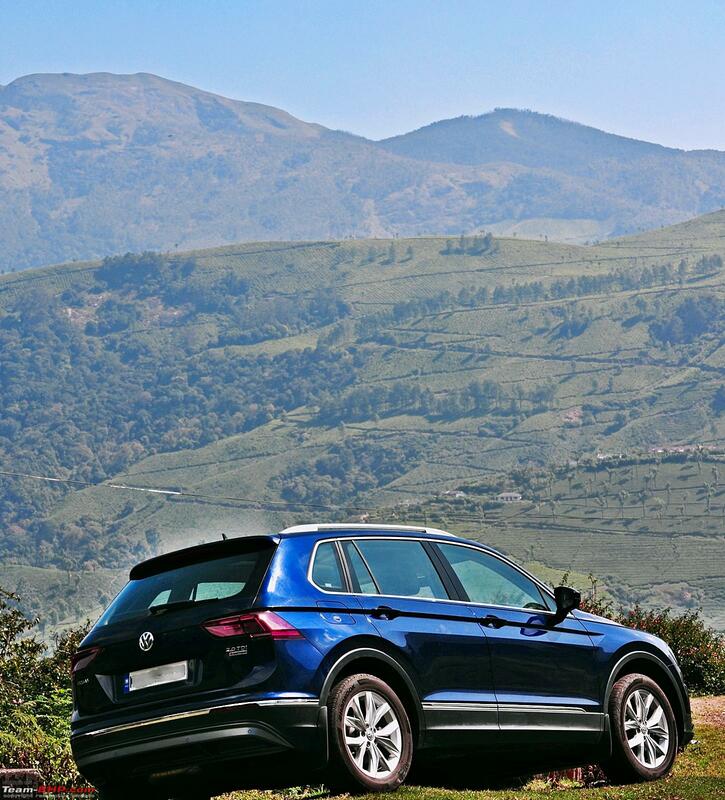 The Tiguan measures 4,486 mm in length, 1,839 mm in width and 1,672 mm in height. It has a wheelbase of 2,677 mm and a laden ground clearance of 149 mm. If above is to be believed, then VW's own sales target for the car was way to low! VW making way for Passat OR Kodiaq? ; Or the reason can be anything. But for the Customer who is looking for to purchase the car immediately, choice is limited. I can even say that the sale is driven by VW, rather than the choice of the Customer! Tiguan 2018 model will have some silent upgrade / add-on for sure! Blessing in disguise? Passat is very tempting too! What is DCC by the way? What is DCC by the way? Dynamic Chassis Control. VW's variable suspension system. IINM the new Passat has it. I would like to add my 2 cents to my ownership experience, 3 months and 3000+ KM drive (mix of the city and highway) has been blissful. In the city I drive in the Eco mode, which I feel is adequate power for stop and go traffic and it returns fantastic milage 12+ and on the highways, she is very well planted and confidence inspiring in the sports mode. I never felt lack of power while overtaking, I do prefer to override the DSG with the paddle shift. I would have loved the AID (Active Info Display) that would a groovy. To sum is up, I feel like driving an AWD sedan (in a good way) with good ground clearance and ability to drive over any road, potholes, craters or speed breakers. Hope this helps. ... 3 months and 3000+ KM drive (mix of the city and highway) has been blissful... To sum is up, I feel like driving an AWD sedan (in a good way) with good ground clearance and ability to drive over any road, potholes, craters or speed breakers. Hope this helps. ...I am very happy with Tiguan that offers every feature I intuitively seek... High maintenance of Germans is a myth (Maruti is an exception)- I pay 2-3 times more on upkeep of my i10 than my Vento (service interval of 15K kms vs 5K kms on i10 is a big factor). Thanks all for sharing your ownership experiences. Much appreciated! One thing I'd like to know you all's feedback on audio capabilites of the car. I mean, in your opinion after driving clocking 2000+ km (and hopefully listening to music all this time), do you think that Tiguan would need an ICE upgrade? I'm asking because I spend almost 3.5hrs every weekday on road, and having a good sounding ICE is high on my priority list. I drive Verna right now, and have Infinity Kappa Components at front, Kappa Coax at rear, Focal SBP30 sub, driven by Visonik v4208 Amp and I'm happy with the SQ. I know I might not get the same SQ on a factory setup (unless I'm really lucky! ), but I don't think aftermarket upgrade/install of amp+subwoofer is even an option due to warranty concerns. I know it is fairly subjective, but still asking because with dealers not having TD cars, I haven't been able to check out the SQ myself - hence the question to the owners. I had a short test drive yesterday and I did discuss the stiff ride quality with the SA. He suggested to keep the tyre pressure around 32, which according to him is the recommended level for comfort . I did ask him why VW is recommending 36/38 for the car if that is the case. I did not get any satisfactory answer for this. While we were driving he has shown me the TPMS and the tyre pressure was showing 30. I think VW is deliberately keeping it low for the TD vehicles so that the experience will be better for the prospective buyers. I am inclined to go for the Comfortline for the simple reason that it costs a whopping 4 lacs less. The added bonus is the slightly better ride quality for 17" tyres. I would like to know your feed back on the ride quality, my primary use is going to be on the highways. I can stretch my budget to the Highline if needed but not intending to stretch it further to go for the Koidiaq. I liked the Tiguan interiors better than the Kodiaq and I dont need a seven seater. If you are not a fan of the amazing sun roof Tiguan has, then go with the comfortline. The ride quality is much better on 17" and interiors are livened up by the silver accents. The ride is still on the stiff side and you would feel the deep cracks and creases of the road but is comfortable. Ride on 18" is too hard and suspension never really settles expect for the ultra smooth expressway. I had a short test drive yesterday and I did discuss the stiff ride quality with the SA. He suggested to keep the tyre pressure around 32. I have been keeping at 32 and felt it improves the ride quality slightly better. I didn't get a chance to test drive Comfortline, so can't comment about the 17" tyres ride quality. If you have kids, definitely get the highline just for the sunroof. It is awesome and my 8 year old son and wife loved it during our Munnar drive this week. If not for sunroof and AWD, I would pick Tucson. Here is my vacation drive update. I did Bangalore-Kanyakumari in the night, mostly relaxed speed with cruise control and Tiguan returned 18.9 FE with 81 kmph average. My return was from Munnar to Bangalore during the day and the FE was at 14.6 with 59kmph average. Even in the Munnar hilly terrain, I got around 11 kmpl. So really impressed with the FE. Felt the under powered engine at few overtaking situations, but the quick shift SPORT mode and paddle shifts came for rescue. 1800 km in one week and the drive was very pleasant and comfortable. It is awesome and my 8 year old son and wife loved it during our Munnar drive this week. Actually both. My son did stand up for over 2 hours, pretty much the entire distance from Munnar to Chinnar. I drove dead slow enjoying beauty of the pristine valley and took 2 hours to cover this distance. Though narrow, the road surface was very smooth and traffic was very light. One other observation I had during the full day return drive was that the cabin is protected very well from the outside heat. Glass surfaces do an excellent job in resisting the heat so that the AC does not have to overwork to keep the cabin cool. My CEDIA and i10 barely resists the heat from direct sunlight and even shorter journeys becomes unbearable at times. Premium experience comes at a premium price! Here is one click from the drive.